IMG’s international security consulting experts are following the battle for Mosul, which has been underway since October. The hard-fought military campaign to liberate ISIS’s last stronghold in Iraq is now entering its fifth month. Because Mosul is divided in half by the Tigris River, the initial assault focused on the eastern half of Mosul. In January, Iraqi forces captured eastern Mosul and declared it fully liberated. The push to free western Mosul followed soon afterwards and could take several more months to complete. The western battle for Mosul could prove daunting due to the fact that this area of the city is built up and densely populated. The western half is also home to approximately 750,000 civilians, many more than in eastern Mosul. Additionally, western Mosul’s narrow streets could result in deadly chokepoints and make it difficult to access aid and resupply. 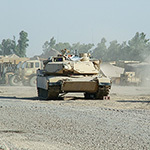 Tanks and large machinery will also have a tough time traversing the city’s roads, meaning a potential loss of firepower for Iraqi troops. So far, the Iraqi forces have made some significant gains in western Mosul. For example, the Mosul airport and adjacent military base have both been retaken from ISIS. On Wednesday, March 1st, the Iraqi army units took control of the last major road out of western Mosul held by ISIS, trapping the militants in the city. The five bridges within Mosul itself have also been cutoff, severing ISIS’s logistic routes. Although there has been considerable progress in the battle for Mosul, the Iraqi forces continue to struggle to secure the city’s southwestern edge where a dense collection of houses and thousands of civilians are frustrating the fight. The battle for Mosul operation involves a 100,000 strong alliance of Iraqi soldiers, police, Kurdish Peshmerga forces, Sunni tribesman, and Shiite militiamen with air and advisory support from an international coalition. The coalition is battling several thousand ISIS militants who are using mortars, sniper fire, booby traps and suicide car bombs to fight the offensive. Lieutenant General Stephen Townshend, the US commander in Iraq, said he believes that friendly forces will recapture Mosul within six months. The liberation of the city would deliver a crippling blow to ISIS, potentially ending the group’s ability to carry out major military operations in Iraq. The IMG Group is a leading international security consulting firm with considerable experience in executive travel security and crisis management consulting. Corporate or business organizations concerned about their need for global security expertise can reach out to the IMG Group for assistance. The company’s expert security consultants provide services such as employee travel security, VIP and executive protection, corporate risk assessment, international meeting security, technical surveillance countermeasures and more.